Create a variety of looks with just one drawing. For a stained glass effect, place colored cellophane, vellum, or tissue behind the film. This uniquely versatile black-coated sheet can be scratched with a wood stylus to expose the clear film beneath. Once the drawing is etched, select a background of opaque colored paper, foil, or other colorful material and place it behind the scratched design for fascinating results. 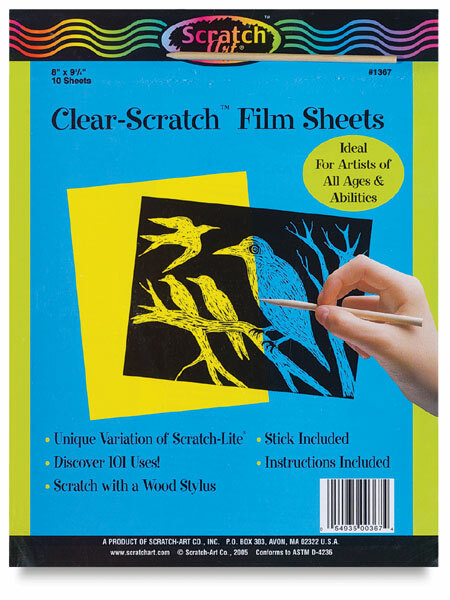 Clear-Scratch sheets can also be used as a positive film mask with photographic paper or light-sensitive blueprint paper. Instructions are included. Sheets measure 8" × 9¾" (203 mm × 248 mm). Pack of 10 includes a wood stylus.